The Viaje Full Moon Edicion Limitada 2015 is a special off-shoot of Viaje Cigars’ Halloween themed line – the Viaje Full Moon. It was in 2013 when the first Viaje Full Moon offering was released. Since then, Full Moon was been an annual small-batch release from Viaje. From its inception, each year the Full Moon has been a Nicaraguan puro, but in 2015 the Full Moon Edicion Limitada would also offer a San Andres Maduro version of the Full Moon. While most of the Viaje portfolio is small batch and limited, the Viaje Full Moon Editon Limitada 2015 was even more limited – released to only five select retailers (who were not announced in advance) nationwide. Recently, I’ve had an opportunity to smoke the Viaje Full Moon Edition Limitada. Overall. while not the best Viaje maduro release, it’s nonetheless a solid one. 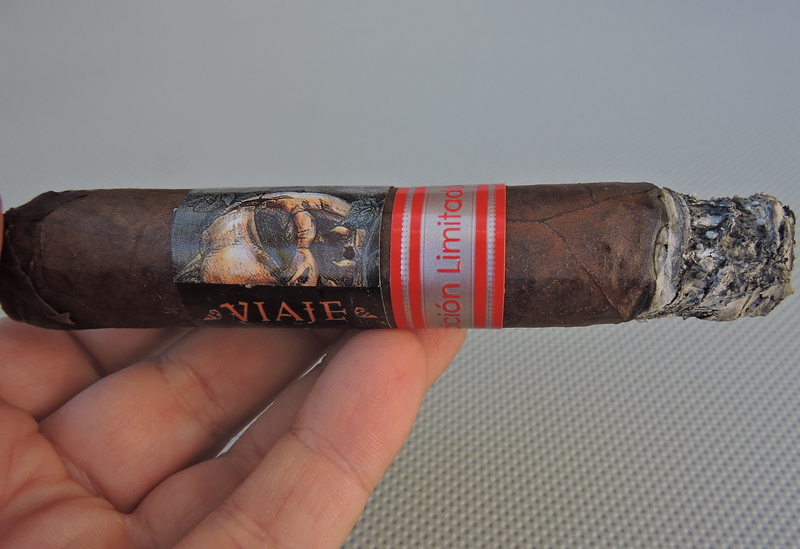 Viaje’s Edicion Limitada releases have appeared over the years throughout the various lines. Typically the Viaje Edicion Limitada have been different sizes or blend variations. For the most part, these have been one time releases. Edicion Limitadas have been seen across lines such as the Viaje Oro Reserva, Viaje Platino Reserva, Friends and Family, Skull and Bones, and Holiday Blend lines. Now the Full Moon line has its own Edicion Limitada release. Without further ado, let’s take a closer look at the Viaje Full Moon Edicion Limitada 2015 and see wha this cigar brings to the table. As with most Viaje Maduros made in Honduras and Nicaragua, the Viaje Full Moon Edicion Limitada 2015 uses a San Andres Mexican wrapper. The San Andres wrapper of the Viaje Full Moon Edicion Limitada 2015 had a coffee bean color with a slight colorado red tint to it. Upon closer examination, there is some darker marbling that can be seen on the surface. The wrapper also contains a light coating of oil. The San Andres wrapper also had a rugged look to it with visible veins and visible wrapper seams. The cigar also features a covered footer. Like the regular Full Moon offering, the Viaje Full Moon Edicion Limitada 2015 has two band variations. Common to both bands is the band has a gray, black, brown, and orange halloween themed image. The difference is that one band has the text “VIAJE” in a large orange Halloween style font. The other band has the text “FULL MOON” in the same style font. There is a secondary band on the Full Moon Edicion Limitada. 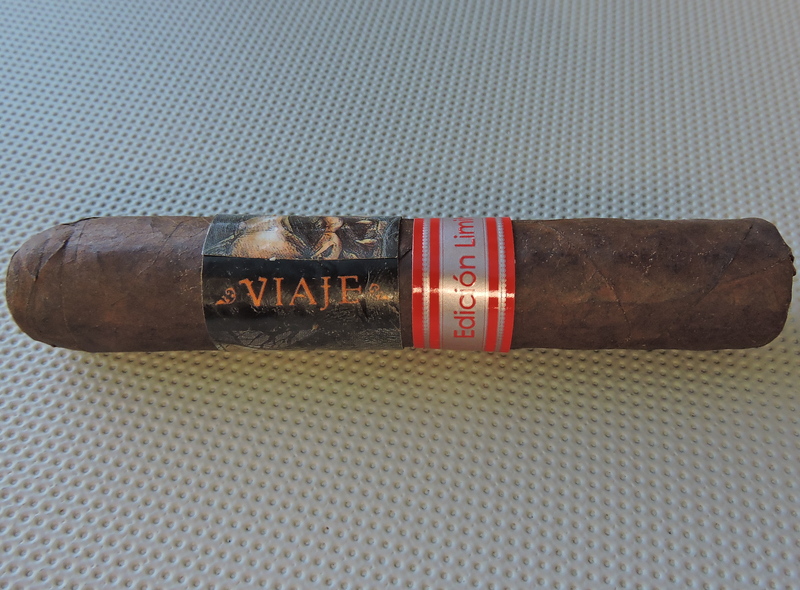 It is a similar secondary band seen on many of Viaje’s Edicion Limitada offerings. The band is located just below the primary band. It features the text “Edicion Limitada” in red font on a silver background. There are two thin red pinstripes above and below the text. As I normally do, I started my experience with the Viaje Full Moon Edicion Limitada 2015 with a straight cut. Once the cap was removed, I moved on to the pre-light draw. The cold draw delivered mostly black coffee notes. I was also able to pick up some a slight amount of pepper. Overall I considered this to be a satisfactory pre-light draw. At this point I was ready to light up the Full Moon Edicion Limitada 2015 and see what the smoking experience would have in store. The Viaje Full Moon Edicion Limitada 2015 started out with a slight blast of red and white pepper. It didn’t take long before some dark roasted coffee notes surfaced in the forefront. Meanwhile the pepper receded into the background and took on more of a red pepper varietal. This red pepper was also present on the retro-hale. Meanwhile I detected notes of dried fruit in the background. As the Viaje Full Moon Edicion Limitada 2015 moved through the first third, the dried fruit notes became more prominent and joined the coffee notes in the forefront. During the second third, a damp earth note emerged and joined the dried fruit in the forefront. Meanwhile the coffee joined the pepper as a secondary note. Later in the second third, the dried fruit note morphed to more of an orange note. This had some sweetness, but also had a sour component to it. Meanwhile the damp earth notes were present with the orange in the forefront. The red pepper and coffee remained in the background with the coffee occasionally making it to the forefront. There were no changes throughout the last third. Occasionally the sourness from the orange note was a little more than I preferred. This is the way the flavor profile of the Viaje Full Moon Edicion Limitada 2015 came to a close. The resulting nub was firm to the touch and cool in temperature. The burn line of the Viaje Full Moon Edicion Limitada 2015 had some waviness to it. It required a few touch-ups, but overall this was a cigar never in danger of tunneling nor canoeing. The burn had an ideal burn rate and ideal burn temperature. The resulting ash varied in color on the two samples smoked for this review. On one sample, it had a darker colored salt and pepper ash (see photo below), while on another one it had a lighter complexion. The ash itself was not overly firm, but was not loose and flaky either. The draw had a touch of resistance to it – which is something I like. Overall I found the Full Moon Edicion Limitada 2015 a low maintenance cigar to derive flavor from. In terms of strength and body, I assessed the Viaje Full Moon Edicion Limitada 2015 as being a medium strength and medium-bodied smoke. There was a slight increase in intensity of both attributes along the way, but overall I still found the attributes to remain in the medium range by the end of the smoke. At the same time, the strength and body balanced each other nicely with neither attribute overshadowing the other. Overall I thought the Viaje Full Moon Edicion Limitada 2015 was an enjoyable smoke. 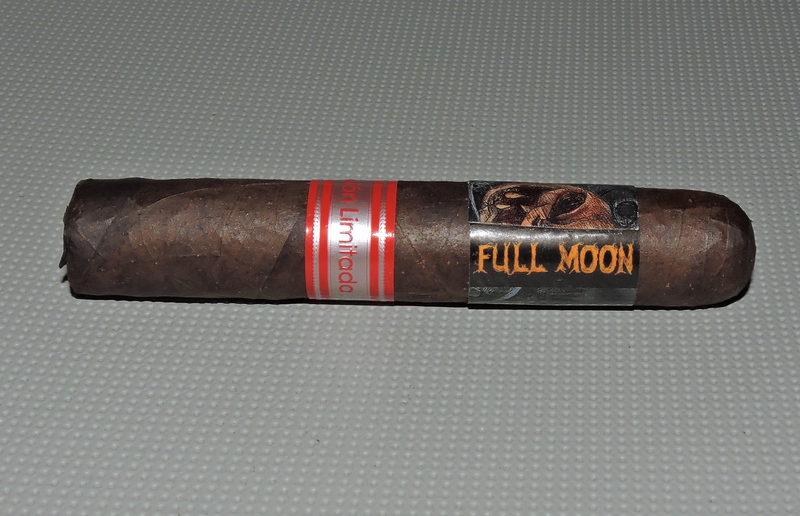 It was fun to smoke a maduro version of the Full Moon blend. With the flavor profile, I found the first half better than the second half. In particular I thought some of the sour notes late in the smoking experience didn’t work in favor of this flavor profile. While it was still a nice change of pace for the Full Moon line, I didn’t find it enough to capture my attention over the Full Moon Nicaraguan puro offerings. Still there are more positives than minuses with the Full Moon Edicion Limitada 2015 . This is a cigar I’d steer toward an experienced cigar enthusiast, but wouldn’t discourage a novice from trying. As for myself, this is a cigar I would definitely smoke again – and it’s worthy of a fiver.